The HP CP5225dn Color LaserJet Pro Printer is designed to enhance the workflow at your workplace by meeting your printing requirements. It is a reliable device which features latest features like automatic duplex printing and N-up printing. With an auto duplex printing feature of the HP CP5225dn Color Printer, you can print both sides of a sheet whereas the N-up printing allows you to print multiple pages on a single sheet. The CP5225dn Color LaserJet Pro Printer offers you the monthly duty cycle of up to 75000 pages which means you can print up to 5000 pages per month. If you’re operating on a small scale, consider investing in the HP CP5225dn Printer. It is compact that can be easily placed on the office desk. The CP5225dn Color Printer gives first black/white printout in 14.5 seconds and first colored printout in 15.5 seconds. Economical Printing Automatic duplexing and N-up printing (multiple pages per sheet) features save paper. Duty Cycle Note Duty cycle is defined as the maximum number of pages per month of imaged output. 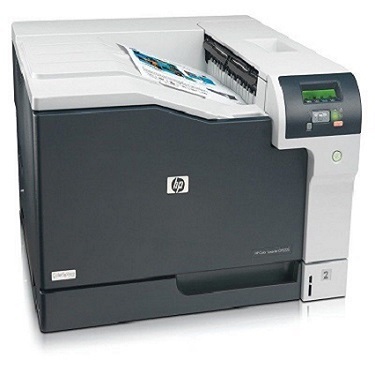 This value provides a comparison of product robustness in relation to other HP LaserJet or HP Color LaserJet devices, and enables appropriate deployment of printers and MFPs.